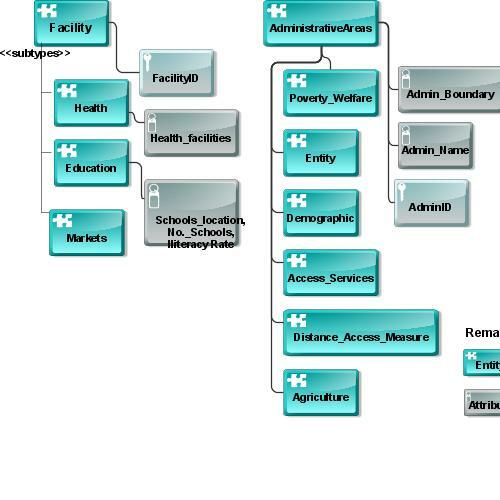 A database conceptual model for the physical representation of location data for managing poverty reduction programs. This model portrays the information required to support the achievement of the World Millennium Development Goal to reduce worldwide by half the 1.2 billion people living on less than 1 USD daily (that is extreme poverty). Supporting the Millennium Development Goal by handling poverty reduction as a location based problem . This data model helps indentify the relevant entities, attributes, relationships and entity behaviour in a database. I agree that the poverty is a growing problem worldwide. It is regettable that a big percentage of the world´s population is affected. The approaches inform you correctly which factors account for poverty. I like to thank you for this informative database model. And i wish you good luck in the competition and i would like to encourage you to submit another ARIS Express model. Felicia, do you have other types of diagrams? For example to represent some business processes and relationship between bp and Data Model?